At Lifton Hall we try to look after the needs of all our guests. 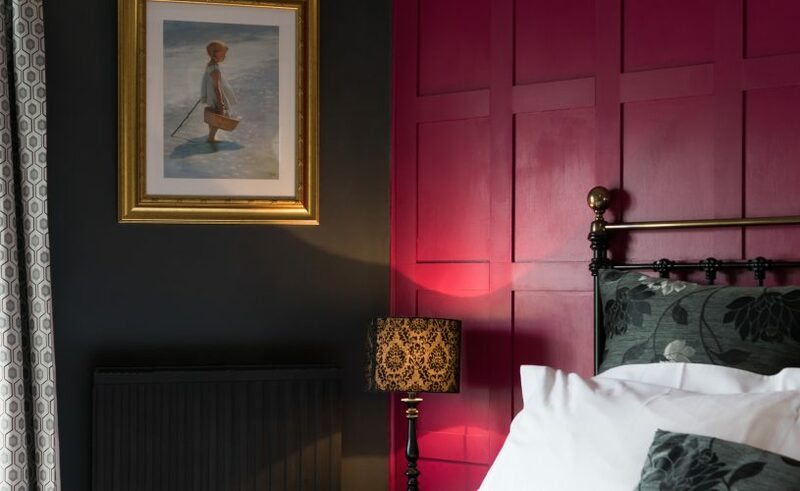 We want to make sure that everyone enjoys their time with us, whether they are staying overnight, having a drink in the bar, or sampling our menu in the dining room. This Access Statement summarises our establishment and what we offer. Lifton Hall is Grade II listed and parts of the building date back to the early 1600s. This slightly limits us when trying to accommodate all disabilities – but we try our best. If you have any questions or queries about anything in our Access Statement please contact us or pop in and we will be happy to help. We are located on the main road through Lifton village. Lifton is clearly signposted from the A30, just east of Launceston and the Devon Cornwall border. You should leave the A30 at the Liftondown exit and follow the signs for Lifton village, Hotels and B&Bs. There is a bus stop right outside the hotel that offers a limited service between Exeter and Newquay, via Okehampton. Buses are provided by Western Greyhound – service number 510. The nearest rail stations are at Exeter, approximately 50 minutes away by car, and Plymouth, which is also about 50 minutes away. Taxis are usually available outside both stations, but it’s cheaper to pre-arrange one – please call us for details and taxi numbers. The nearest airports are at Exeter and Newquay (both about 60 minutes away). Information can be provided in large print if required. We regret we don’t have facilities to prepare documents in Braille. We have ample private car parking located at the front of the hotel. The entrance (and exit) to the car park is directly after the building as you drive down the hill through Lifton. The car park is level and covered with small chippings. It is illuminated at night. There are marked parking spaces on either side. Please let us know if you need a space close to the hotel. We can reserve a space for your arrival. Check-in is normally from 3pm. Earlier arrival is usually possible, but please let us know in advance. The car park is level with a patio area in front of the hotel. The patio is terraced over three levels – with a small step of 5cm between each. The edge of each level is highlighted in white. Our main door opens outwards. It is 90cm wide. The hotel reception is just inside the entrance, and unless you are in one of the upstairs guest rooms there are no more steps to negotiate. The reception area has a Cornish slate floor with a large loose rug that has a non-slip sheet beneath it. All other areas either have fitted carpets/vinyl covering or are wooden floors. The front door remains unlocked until the bar closes at approximately 11pm. Your room key includes access through the hotel main door should you need to come and go any later than this. A bell is found on the reception desk to summon assistance. Assistance with luggage is offered to all our guests. We have a guest lounge, bar and dining room – all accessed from the main reception hall on the ground floor. The bar is carpeted and there is a short slope between the two bar areas. There are two staircases in the hotel. The main stairs, from Reception, has 6 steps to a half landing then a further 5 to the first landing where there are two guest rooms. There are further guest rooms up 5 more steps to the left. To the right are another two steps and then a single step, that lead to further guest rooms. This staircase has wide treads and low risers. The first 11 steps of the stair case have a hand rail on both sides. The remaining steps have a rail on just one side. The steps are covered by a fitted carpet. The second staircase, towards the rear of the hotel, has 12 fairly steep steps to a landing where there is a guest room. A further 3 steps lead to the first floor and access to most of the rooms. The first flight of steps has a single hand rail. The remaining 3 steps does not. The steps are covered by a fitted carpet. We have guest toilets, male and female, located towards the rear of the bar. They can also be accessed through the lounge – where there is a single step down. Nine of our guest bedrooms are on the first floor and one on the ground floor. Further details can be found in the Bedroom section below. 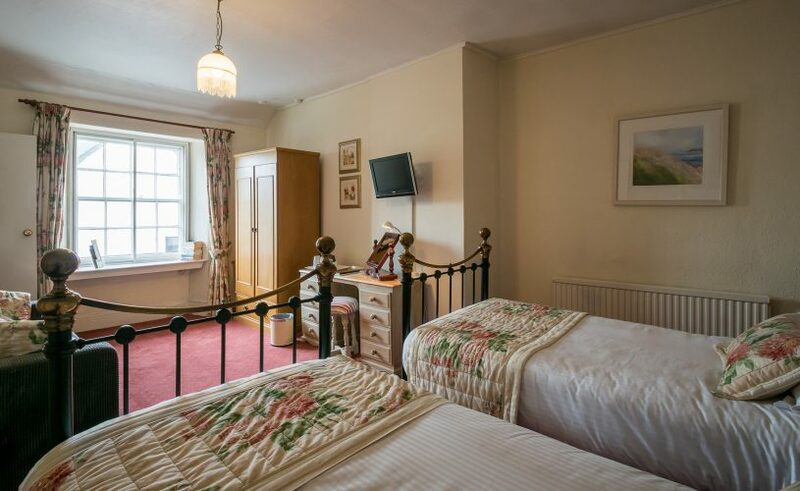 Lifton Hall has central heating in all areas with individual thermostats on all bedroom radiators. Electric fans are available for the rooms during hot weather. Guests are welcome to use the lounge at any time. It is furnished with a selection of chairs and tables, and a large window seat. The lounge has a flat, wooden floor. There are two doors – 71cm and 74cm wide. A selection of books and magazines, along with board games can be found in the lounge. Our tables are of standard height and can easily accommodate people in a wheelchair. The dining chairs do not have armrests, however, these can be provided. The dining room has a flat, wooden-look floor. The door is 77cm wide. Breakfast is usually served in the dining room. A full and varied breakfast menu is offered and any dietary requirements can be catered for with prior notice. Lunch is usually taken in the bar or lounge. Evening meals can also be taken in the dining room and we offer a varied menu using locally sourced, high-quality produce. Chef is always happy to discuss any dietary requirements you may have. We play low-level, background music. The bar is split into two main areas, one of which is slightly lower than the other and can be reached by a short slope. The floor is carpeted, apart from the area directly in front of the bar counter, which is tiled. The furniture is a mixture of tables and chairs in different styles. There is also a chesterfield type sofa, which is low. We serve a variety of quality beers, fine wines and spirits, as well as a selection of soft drinks and hot beverages. Bar snacks and meals are available in the bar at lunch time and during the evening. The bar is small and cosy, with a wood-burner that is lit during colder weather. If you would like further details or information, or have any comments about the facilities/services we offer please feel free to contact us. 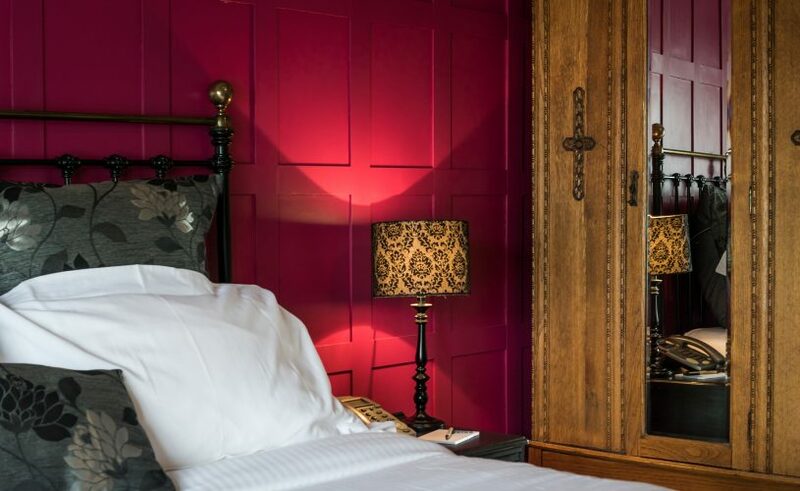 We have ten guest bedrooms – eight doubles and two twins. One of the twin rooms is on the ground floor. The remaining nine rooms are on the first floor and are approached mainly by the stair case from reception. All rooms are fully carpeted with en suite bathrooms. All rooms have TVs that incorporate an alarm clock. All rooms have tea and coffee making facilities. If you would like real milk please let us know. We also provide a hairdryer and a selection of books. Each room has a seating area, with either armchairs or sofa. Beds are made up with crisp white cotton under-sheets, white cotton covered duvets and soft Oxford pillow cases. Some beds have throws. There are extra blankets and pillows in the wardrobe. All the beds are 5ft king beds, unless otherwise indicated. Carnarvon – (first floor – left of main stairs) is a large double room. Its door is 70cm wide. There is a spa bath and separate shower room that has a 65cm door. Ramsey – (first floor – left of main stairs) is a double room. The room door is 80cm wide. It has an en suite shower room with a 70cm door. 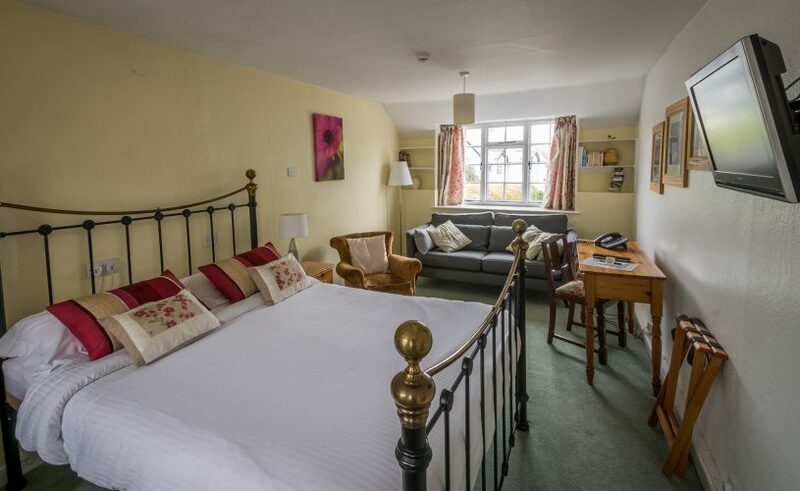 Shipton – (first floor – left of main stairs) is a twin room with 3ft twin iron beds. It has an en suite shower room. Deanery – (first floor – top of stairs) is a large double room that can accommodate a family of 4. The door is 75 cm and there is a step up into the room. As well as the 5ft double iron bed it has a double sofa bed. Darliston has an en suite shower room – door width 65cm. Barbican (first floor – top of stairs) is a delightful double room. The door is 75cm and it has a step up into the room and down to the en suite shower room – door 65cm. Eleanor (first floor – right of main stairs) is a double room with an en suite shower room. Main room door is 70cm and bathroom door 65cm. 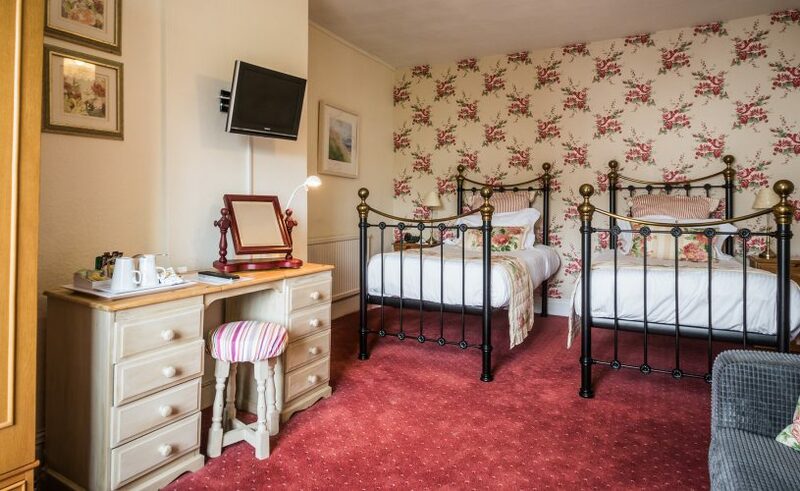 Granville (first floor – right of main stairs) is a large double room and the second of our family rooms. There is a 4ft 6in four-poster bed and a double sofa bed. The room door is 77cm. There is an en suite bathroom with a 72cm door. Coppice (first floor – right of main stairs) is another large double room that can accommodate a family. There are three steps down into the bedroom where there is a double bed and a sofa bed. The en suite bathroom is on the same level as the door into the room. Priory (first floor – top of rear stairs) is a double room with a 4ft 6in bed and an en suite shower room – door 72cm. The main room door measures 75cm. Alway (ground floor) is a large doubl eroom. It has an en suite walk-in shower with folding seat and handrails. The sink has easy-use taps. The main room door is 78cm wide and the bathroom door 74cm, which opens outwards. All our bathrooms have shaving mirrors and separate magnifying mirrors, complimentary Lux shower/bath soap and shampoo. We provide fresh white towels and face cloths. Carnarvon – has a spa bath (edge 53cm from floor), walk in shower cubicle with 23cm step up and 65cm opening door. There is a single basin and WC. Ramsey – has walk in shower cubicle with 18cm step up and 30cm corner opening door, single basin and WC. Shipton – has walk in shower cubicle with 18cm step up and wide corner opening door. There is a single basin and WC that has slightly restricted headroom. Deanery – has walk in shower cubicle with a 30cm corner opening door and a step up of 27cm, a single basin and WC. Barbican – has a walk in shower with a wide corner opening door and a step up of 18cm, single basin and WC. Eleanor – has large shower cubicle (door 90cm). there is a 10cm step into the cubicle. There is a single basin and WC. Granville – has a bath (edge 55cm from floor). There is a shower over the bath with a shower curtain. Single basin and WC. Coppice – has a bath (edge 55cm from floor). There is a shower over with a shower curtain. The room also has a single basin and WC. Priory – has a walk in shower cubicle with 20cm step up and 60cm door. There is a small step down to a single basin and WC. Alway – has walk-in shower with a 15cm step and 50cm door space. There is a folding seat and handrail. Single basin with easy-use taps and WC. We have two outside seating areas – one to the front and one to the rear. The patio area to the front is accessed from the car park, from reception and through French windows in the dining room. The patio area is on the same level as the car park. It is terraced over three levels and the edge of each is highlighted in white. There are four sets of wooden tables and chairs. On the other side of the carpark is a raised lawn with mature tress and shrubs. It can be accessed by steps from the corner of the car park. To the rear of the hotel is a small outside seating area that is accessed via a door from the bar. The area is level and contains four bench-tables. Fire evacuation notices are displayed in the bedrooms and throughout the hotel. Each room has its own smoke sensor and fire alarm. In the event of fire a very loud continuous alarm sounds. If there is a power-cut the emergency lighting comes on. We have a portable Deafgard fire alarm system for those who are hard of hearing. This consists of a vibrating pad to go under the pillow and a bright strobe light. The Deafgard is activated on hearing the main alarm. Evacuation is via the front door and two fire exits, which are clearly marked. Assembly point is the far side of the car park (also marked). Please advise us if you think you would require assistance in the event of fire. Door hangers are available in each room to indicate a need for assistance – these are checked every night. Fire extinguishers are found throughout the building, as are fire call points. If you discover a fire please call 9 – 999 from your room phone, raise the alarm and alert a member of staff. Lifton Hall Hotel is a non smoking establishment throughout but guests may smoke in the garden (an ashtray can be provided). We are happy to refrigerate any items for guests. There is free WiFi throughout most of the building.